A local basketball court nestled in the town of Golden, just south of Kicking Horse River, is transformed into a skating rink for the winter. Additional outdoor rinks are located at Dogwood Park and the parking lot at Keith King Memorial Park. Neighbourhood shinny matches often go down on the ice—feel free to join! Address: 800 Robson Street. The rink is located at the bottom of the stairs to the Vancouver Art Gallery. Opening Times: Sunday – Thursday9 a.m. – 9 p.m. and Friday and Saturday 9 a.m. – 11 p.m. 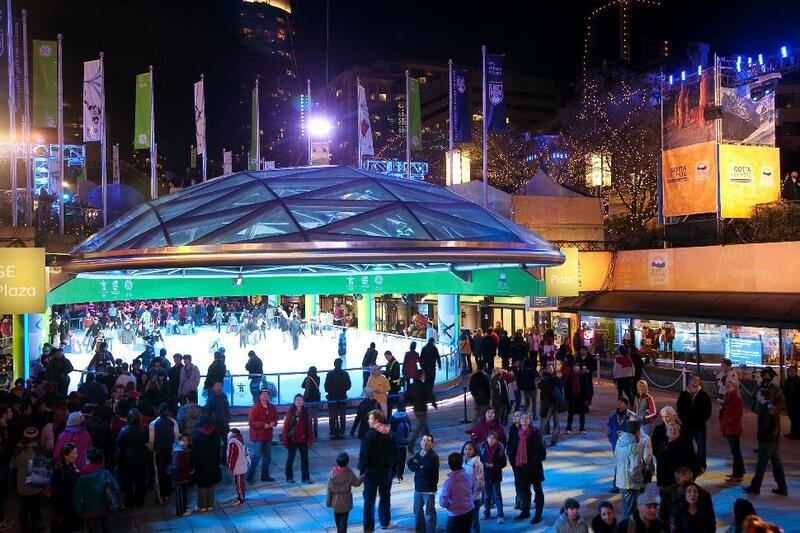 In operation from early December until February’s thaw, Robson Square in downtown Vancouver invites skaters of all levels to show off their moves. The circular glass roof above the rink resembles a snow globe. 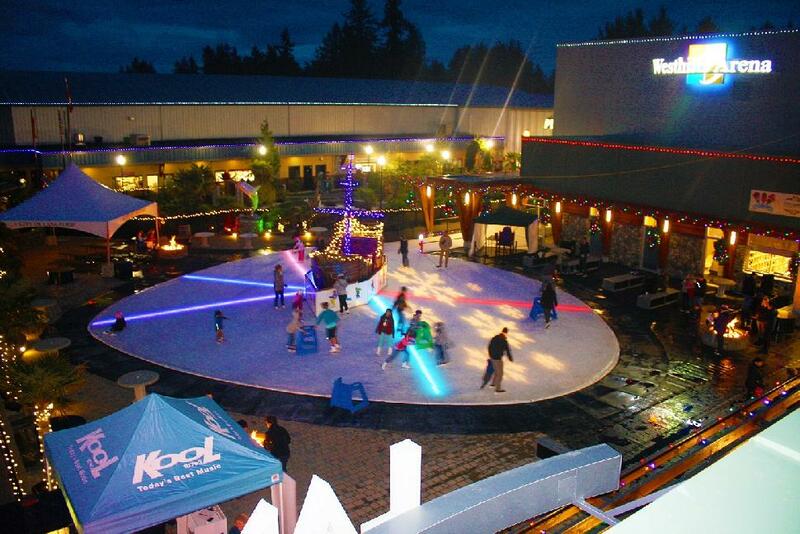 The ice is lit up with neon lights and live music in the evening. 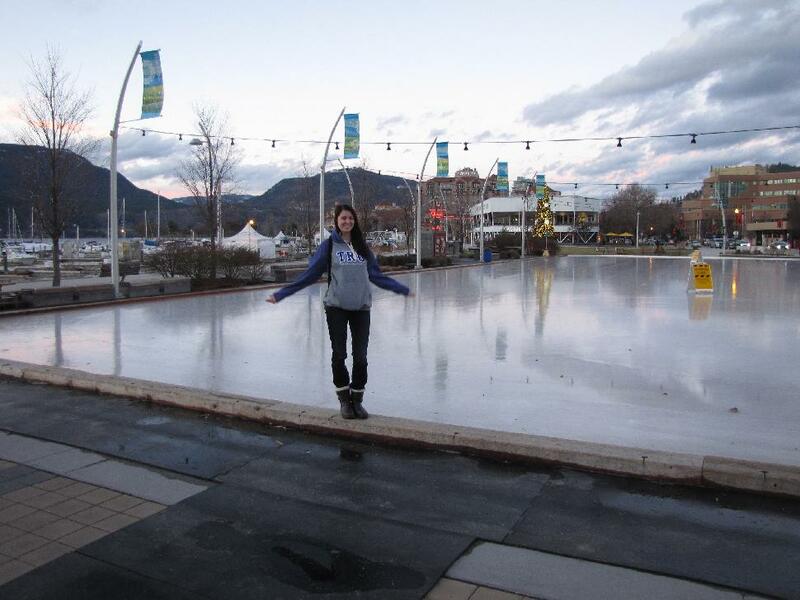 Maintained by the provincial government, the skating rink is even open on Christmas Day and New Year’s Day! After your skate, grab a snack and a steaming hot chocolate from the on-site concession. The Prince George Outdoor Oval is a speed skating venue that offers racers 400 metres of ice to whip across. 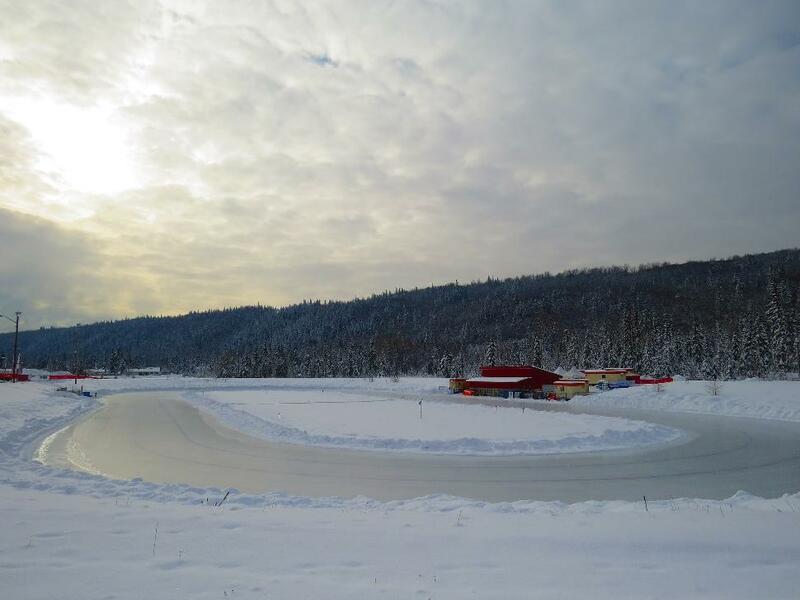 Shaped like a running tack, the Outdoor Ice Oval Society of Prince George with assistance from the City of Prince George manages the natural ice rink. The rink is generally open throughout the week, but it is best to check the schedule and ice conditions online before going. On Sunday mornings, lucky participants may receive skating advice from Nordic blades and speed skaters. Wednesdays evenings are reserved exclusively for Prince George Blizzard Speed Skating Club’s practice. 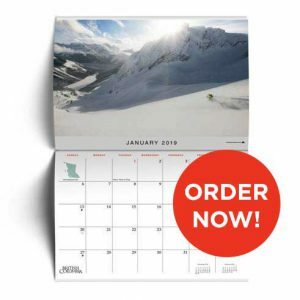 Skate Rental: Available through Bladez Skates. Opening Times: Daily 6 a.m. to 11 p.m.
Kelowna’s downtown outdoor ice rink is lined a Christmas tree, a glowing blue polar bear and a close-up view of Okanagan Lake. 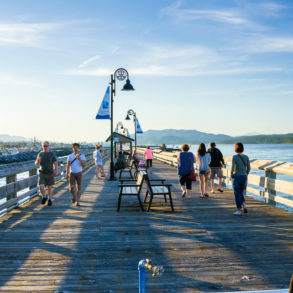 Stuart Park is part of the City of Kelowna’s Waterfront Park Plan, and will be closed for scheduled maintenance daily from 4:30 a.m. to 6 a.m., 11 a.m. to 11:30 a.m., 5 p.m. to 5:30 p.m. and 8 p.m. to 8:30 p.m. Weekly ice maintenance takes place on Mondays from 5 a.m. to 8 a.m.Check the still webcam and sign postings for updated rink conditions. Opening Times: Daily 10 a.m. – 9 p.m.
Two years ago, a Surrey farmer took the initiative to flood his land for his neighbours. Friends, family and strangers were invited to skate on the homemade ice rink, play pick-up hockey and enjoy donated Tim Horton’s coffee in perhaps the most Canadian celebration of skating ever seen. Farmer Jas Singh has given away half a million pounds of his produce to the community over the past five years. He hopes to flood his field again this winter, weather permitting. 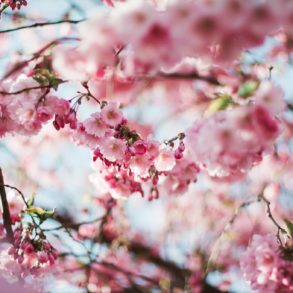 Opening Times: Monday to Friday 4:30 p.m. – 7:30 p.m., Saturday 12 p.m. – 7:30 p.m., Sunday 12 p.m. – 6:00 p.m.
City Centre Park is a hub of athletic activity, from a splash park in the summer to a 10 pin bowling alley. In the winter, City Centre Park contains an artificial outdoor skating rink. 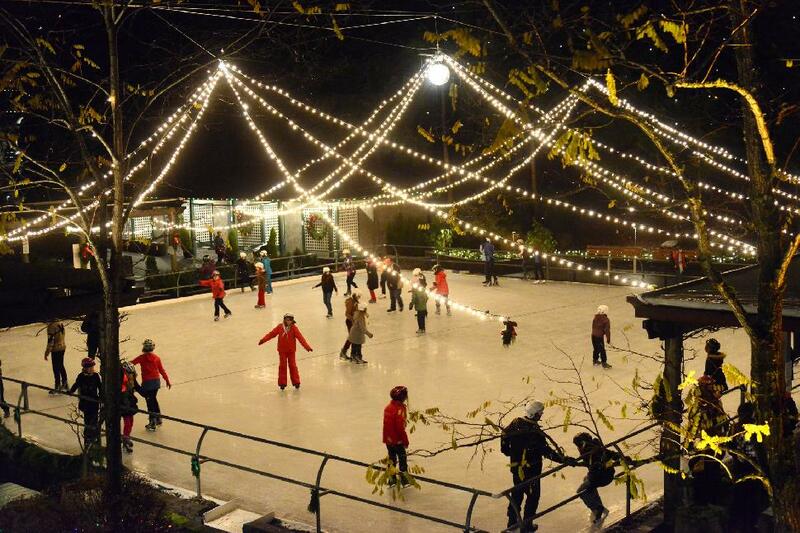 Depending on ice conditions, the rink is open throughout December and January. On Sunday afternoons from 3 p.m. – 4:20 p.m., the ice river is open to connect the outdoor skating pond and the indoor rink. The ice is open for Teen Skate Friday evenings from 7:30 p.m. – 10 p.m. Cost: $5.00 for adults, $4.00 for youth, $3.00 for children. Does not include entrance to the gardens. 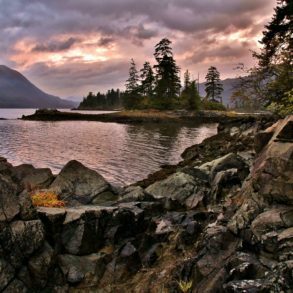 Opening Times: Daily 9 a.m. – 9 p.m.; Christmas Day 1 p.m. – 9 p.m.
One of Victoria’s top attractions, Butchart Gardens can also be enjoyed in the winter months. Strings of white lights hang over the rectangular ice rink. After your 40 minute timed skate, snuggle up next to the blazing fireplace in the poinsettia decorated coffee shop. Address: 4144 Village Stroll. The rink can be foundat the intersection of Lorimer Road and Blackcomb Way. Skate Rental: $5.00. Free helmet rentals. Opening Times: Monday through Sunday 11 a.m. – 2 p.m., 3 p.m. – 5 p.m. and 6:30 p.m. – 9 p.m. 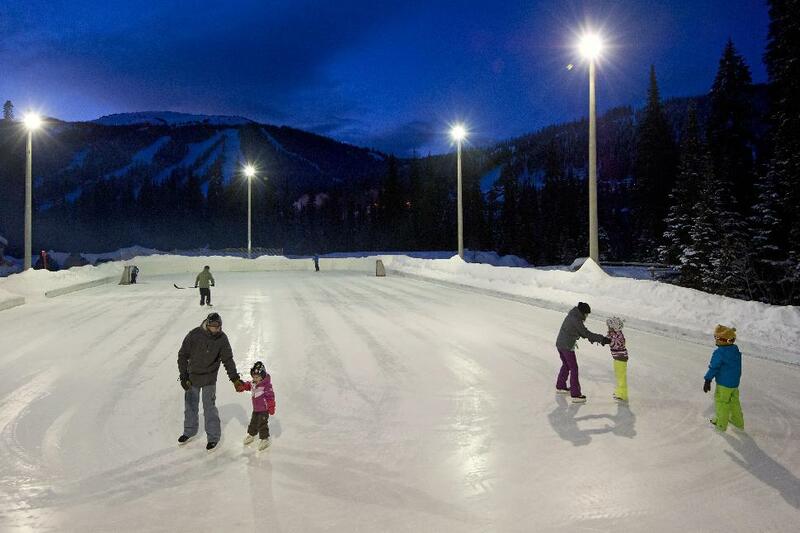 Located in the heart of Whistler village, this family-friendly rink is maintained by the Resort Municipality of Whistler and the Province of British Columbia. Up to 150 skaters can pile on the ice next to the inspiring Olympic Rings. Note: hockey and rough play is not allowed. This friendly community rink is looked after by a group of dedicated volunteers. 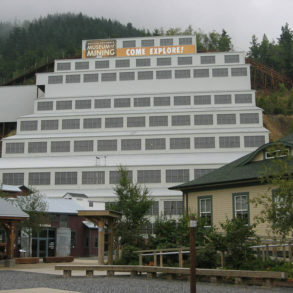 Also known as “Riverside Rink,” this outdoor ice skating arena overlooks the Bulkley River near the town of Smithers. Address: 1280 Alpine Road. The skating rink is located a short walk from the village at the end of Sun Peaks Road. The magical, colourful village at Sun Peaks Resort just outside of Kamloops, B.C. is an ideal place to test out your skating skills. The full-sized rink is a little pricier than outdoor ponds, with drop-in hockey scheduled frequently throughout the week. All around British Columbia, neighbourhoods and communities take the initiative to create and maintain outdoor skating rinks for all ages to enjoy.